Is lupin the new superfood? When it comes to encouraging people to lose weight and improve health there are a lot of pills, scams and potions. Could a family of southern Riverina farmers have a winner growing in their paddocks? Gary Drew oversees the planting of this season’s crop. He is keen to develop the pulse, which is usually exported as livestock feed, for human consumption. Photography by Simon Bayliss. ABOUT three years ago, Gary Drew had an epiphany. He pulled back the tarp from a load of steamed and rolled lupin he was delivering to a cattle farmer mate and released a mouth-watering sweet aroma “like the smell of Uncle Tobys”. Gazing at the gorgeous golden colour he thought, why aren’t humans eating this? It wasn’t an entirely new idea. Lupin, a pulse crop, is part of the legume family and its seeds – also known as lupini beans – have been eaten in the Mediterranean region for centuries. Western Australia is the largest producer of lupin in the world – but the majority is exported as livestock feed. Gary had watched with a mixture of interest and disappointment as the state’s farmers tried with mixed success to develop lupin products for human consumption. “I really wanted their lupin milk to work,” he says of the plant-based drink that seemed set to rival soy milk. “They spent millions on R&D and equipment.” He was also “sick and tired” of hearing people chattering on about superfoods such as quinoa and chia when he knew he was producing something just as good at a fraction of the price. Gary was growing lupin as a break crop to put nitrogen back into the soil between wheat crops on his property, Northwood, at Brocklesby near Albury in the NSW southern Riverina. He was also running sheep and growing canola on the property that had been his father’s and grandfather’s before him. The albus lupin crop in bloom at the Drew family’s property, Northwood, at Brocklesby. Science had shown lupin could be a valuable weapon in the armoury against a range of chronic Western ills, from heart disease to diabesity- diabetes linked to obesity. The Grains research and development Corporation published a study showing that lupins could have a significant impact in the consumer food market in regards to nutritional composition and health benefits. A mixture of frustration and altruism finally spurred Gary into action. He says he had a couple of family members who “weren’t as fortunate as I’ve been”, and decided to set them up with a small business bagging up and selling toasted lupin flakes from the farm shed. His brother Roger, who had spent 20 years working in the not-for-profit sector, sat in on a meeting. He’d always loved the business side of farming and immediately saw the potential, but he also saw a problem. “Every time you fill a bag by hand you’ll lose money,” he told Gary. “This has to be done commercially or not at all." bread, cakes, pikelets and pizza bases. 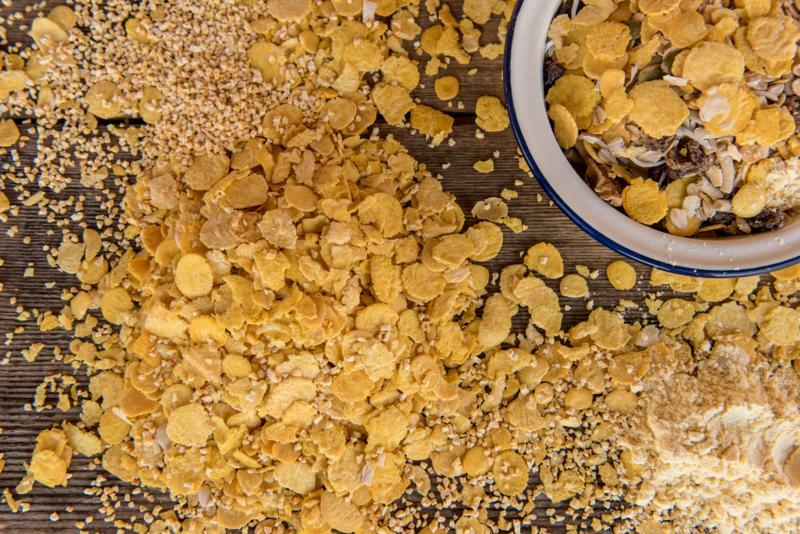 cornflakes and can be mixed into muesli. breadcrumbs on fish or meat. This attitude has already paid off with a high-protein bread manufacturer using lupin flour, and their product even appearing on restaurant menus, such as at DiCasa in Melbourne’s Lygon Street. “For Gary to see his dream on the menu and on the plate… he was in tears,” Roger says. Gary acknowledges that he was overwhelmed, as was his wife Heather, who farms the land alongside him and experiments to come up with new lupin recipes. It’s already far bigger than anything Gary envisioned, and he’s long been regarded as a pioneer in everything from cropping to livestock. Today, Lupins for Life is only wholesaling, but has an online shop due to launch by July. The Drews have held off going to market until they have security of supply and a good web presence. Lupin has been a time- and money-hungry project, as the brothers have even built their own mill and developed a milling process that de-hulls the lupin seed, leaving the kernel intact. And if Gary’s dreams are realised, it’s going to get even bigger. Gary with the lupin seeds at his mixed farming business. He also grows wheat and canola, and runs sheep. With a protein content of up to 40%, and containing 30% soluble fibre, lupin products have a high satiety value, so reduce the desire to overeat. Indeed, Gary has lost nearly 12kg simply by eating his lupin cereal for breakfast. “I haven’t even had to cut my beer consumption!” he says. Lupin is low in fat, low GI, gluten-free, contains minimal starch and has been shown to lower blood pressure and cholesterol, and improve insulin sensitivity. Roger believes the legume could also prove valuable in Third World countries where famine and malnutrition are devastating populations. It seems the only negative to lupin is that it belongs to the peanut family and there is a small chance that people with a peanut allergy may also react to it. Food Standards Australia and New Zealand added lupin to its allergens list in 2017. The finished product, including lupin flour, flakes and kibble. For the Drew family, a bonus is that lupin has brought both Roger and their sister Chris back to the farm. Chris is a director and business operations manager for the company. For Roger, after a 26-year absence, it’s a particular surprise. He left to pursue a degree in theology but at least, he laughs, that still comes in useful for leading the prayers during tricky times – and there have been a few of those. “Our aim is to set the machinery up so we can do a 13-week run to produce 400 tonnes of product, and that’s twice what we need to do to be operationally profitable. Australian farmers generally have a reputation for fortitude, Roger says, and the Drews have theirs burned into their DNA. The family came over from Ireland in 1851 and every tragic or derring-do story handed down since then has underpinned their willingness to have a crack. *Read more about innovative farmers in NSW, like Olympia Yarger from Canberra, who’s feeding food waste to maggots and turning it into livestock feed. The Drews have talked to scientists, visited mills and also asked bakers, restaurants and pasta makers what they needed. “Because this is a new and functional food, there’s an education process around it and most of the ideas of how it will be used will come from consumers and clients,” says Roger. *See our story on the Munro family of Booroomooka Angus for more insight on how intergenerational farmers are utilising their family’s skills for successful farming ventures.